Former Indian skipper Sunil Gavaskar said South Africa took full advantage of India’s relaxed approach and went on to win the fourth ODI of the ongoing six-match series on Saturday. Gavaskar also hit out at Yuzvendra Chahal, saying the two no-balls he bowled were results of little bit of lack of professionalism. The batting legend also opined that modern-day bowlers, who have the backing of technology, should not be bowling no-balls at all, especially in the limited-over cricket. Chahal, who along with fellow wrist spinner Kuldeep Yadav, led India to comfortable wins in the first three ODIs, was taken to the cleaners by the South African batsman on a rain-hit evening in Johannesburg. The 27-year-old conceded 68 runs in just 5.3 overs and had bowled two no-balls and three wides. “For me, it was that no-ball where David Miller was clean bowled and the way he recovered from it. That, for me, was the turning point,” Gavaskar said during a post-match analysis show on Sony Ten 1 on Saturday. Chahal bowled a no-ball, which took the stumps of David Miller. 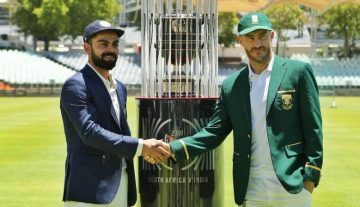 This reprieve proved costly for India as he went to tore India’s bowling line-up apart and put South Africa on the verge of victory. “Till then, India seemed to be in control, they had also seen the back of AB de Villiers, who was batting well. When Miller was struggling to read Yuzvendra Chahal, India were certainly in the driver’s seat,” he further added. South Africa maintained their unbeaten streak in the Pink ODIs and won the fourth ODI match by five wickets.